The modern day road warrior does carry a whole lot of mobile devices around, and these tend to run out of juice along the way, especially during a particularly hectic day when the device is accessed all too frequently. This has transformed the traditional power bank into something that is an essential item not to be forgotten when traveling, and the larger the capacity, the better. The Power Mountain certainly lives up to its name, where it lays claim to being the fastest and lightest 50,000mAh portable power bank in the world. Just what can 50,000mAh of portable juice do for you? That translates to being able to charge up your iPhone 7/8 a good 17 full times, 10 full charges when it concerns the Samsung Galaxy S7/8, 7 full charges for those who love bringing their Nintendo Switch around, and even up to 2 full charges for a MacBook Pro. The entire Power Mountain tips the scales at a lightweight 1.89lbs while fitting into the palm of one’s hand, making portable charging quick and easy while one is on-the-go, in a boring boardroom meeting, in the great outdoors, or simply chilling out at home. With USB-C Power Delivery, it is able to charge connected devices up to 9 times faster compared to traditional chargers. 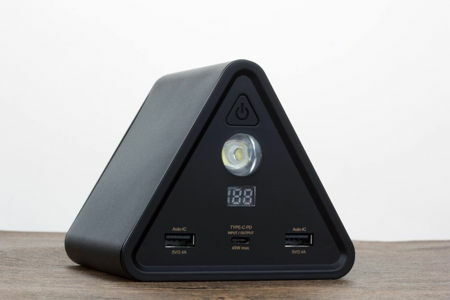 In addition, the Power Mountain comes with a powerful LED light that will be handy whenever there is an emergency, or when you simply need an impromptu torch. The ladies would appreciate this as they rummage through their handbag at night or in the cinema, looking for a particular item within. There are 3 ports that accompany the Power Mountain which offers simultaneous charging (Output: Auto IC 5V/2.4A, Input/Output: Type-C PD 45W max, Output: Auto-IC 5V/2.4A), while a digital battery level indicator makes it easy to see just how many charges left it carries. Made out of shock-resistant aluminum, the cover is also drip- and dust-proof, while its design doubles up as a smartphone/tablet stand. Expect the Power Mountain to arrive in black or silver colors with an asking price of $180 a pop.